High on the bridge it was windy but it was the quickest way. Lapinette grabbed her ears with one paw and held down her frock with the other. The Passerella Olimpica wasn't usually that bad but the wind carried a deafening beep that made them nervous. The Wabbit steadied Lapinette as gusts blew her right and left. "This isn't wind," yelled the Wabbit, "this is sound." The bridge swayed like a drunken pianist. Gale force beeps tore at their fur. The Wabbit shrugged as best he could, gritted his 28 teeth and ploughed on. "It's talking to us," he shouted. Lapinette managed a smile. "Have you been at the cooking whisky again?" The Wabbit thought briefly and decided it was a good idea. "Did you see the shapes?" "I saw some stuff," yelled Lapinette, "and that square nearly hit me in the eye." The Wabbit's ears looped back and flattened. "OK, there's your square, a saw, a sine, and ...." The Wabbit ducked as a triangle whirled past his head. Lapinette was sceptical. "You always have all the angles, Wabbit." The Wabbit agreed, but avoided saying so. "These beeps are nothing but trouble," he grumbled. Lapinette grabbed his fur. "I'll be glad to get off this thing!" 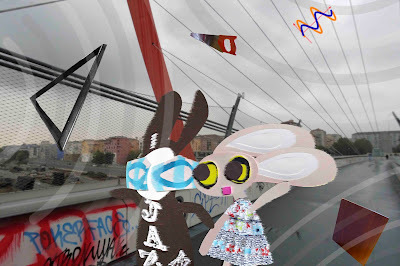 The Wabbit looked into the distance and studied the end of the bridge. It looked perfectly calm and he frowned. "I think we're stuck." "Lapinette frowned too. "On this beeping bridge?" The Wabbit groaned and mimed a radio. "Beep us down, Scotty."